These came together rather quickly with the Fun Flowers Bigz Die and the Big Shot for the Designer Series Paper. I also added two layers of tissue paper cut with two of the flower punches. I found that cutting the tissue paper with a layer of printer paper worked great. The stems were made with a large coil of craft wire that I cut to size. 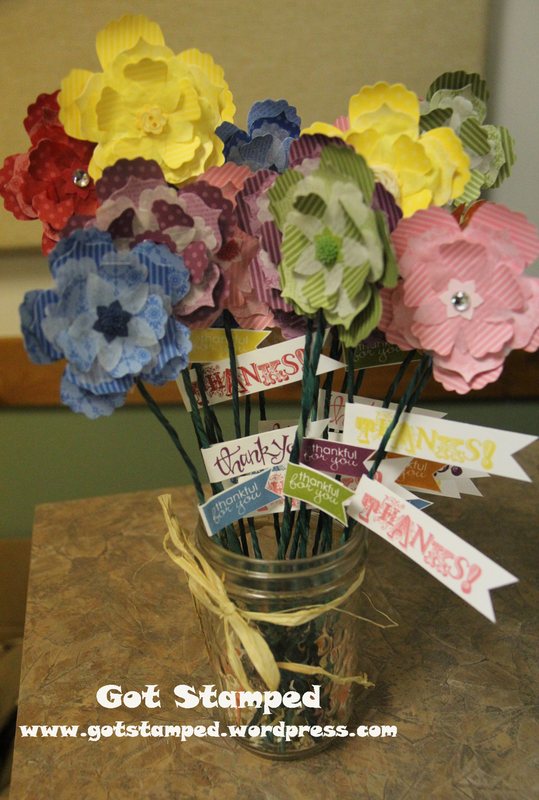 The paper flower layers were held together with Tombow glue. The craft wire I sandwiched with a glue gun between the largest flower and the second largest paper flower layer, which left the back of the flower nice and tidy. Lastly each flower was embellished with a coordinating button, large rhinestone, coordinating dahlia, or a new simply pressed clay flower. It felt great to hand each child care provider a flower that would last forever, just like their love and attention for the children in their care.